Excel Builders of Tennessee > Posts > Uncategorized > As construction continues downtown, what will Nashville look like in future? 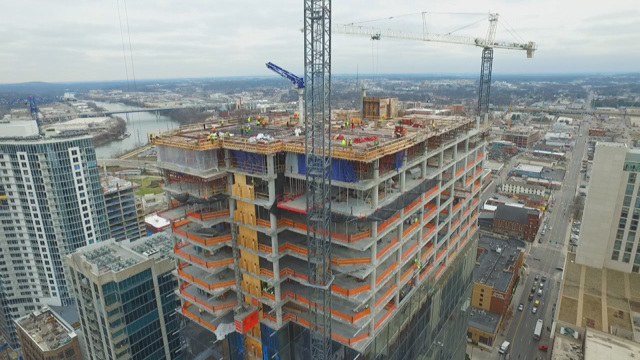 NASHVILLE, Tenn. (WKRN) – No doubt about it, Nashville’s skyline is changing. Right now, cranes and construction can be seen in several areas downtown, but how will the Music City of the future look? As News 2 found out, the answer to that question is still in motion. As a geographic information system analyst, Micah Taylor has an interesting job. Using 3-D modeling and gaming software, he creates three dimensional maps of what the Nashville of the future could look like. “You can see how the sky line will change over time, before and after,” said Taylor. As New 2 learned, the maps are simply a projection and are constantly changing. “It happens so fast. Sometimes you know if there is a crane and something is under construction, and sometimes, something is still in the proposal phase. And we may or may not get a model to put on a 3-D version like this,” said Taylor. Craig Owensby is with the planning department. He told News 2 we can expect to see Music City change both in its structure and demographic layout. “The research we did as part of ‘Nashville Next’ shows that there will be about a million additional people over the next 25 years. It will be about 2.6 by 2040. Davidson County will be the population of Denver, Williamson and Rutherford will have the population of Davidson,” said Owensby. As Owensby explained, like it or not, you can’t stop the growth, which is why city leaders are trying to get out ahead of it. They are brainstorming on structural changes they can make to the city. They are also taking into consideration more than 19,000 community comments on what people who live here now would like to see happen. Owensby showed News 2 an animation of how an upgraded Lower Broadway could look, again the animation is simply a concept. An exact plan for construction on the designs could change. The Metro Planning Department animation created for News 2 shows current projects that have been approved or are already under construction. To see the Metro Planning Department’s animation of approved downtown projects and projects under construction click here. “The growth is coming, for a good reason. It’s positive growth, and if we charge our responsibility not only as planners but as citizens, to ensure that growth is positive. Then we will all benefit,” said Owensby. Click here to see the Metro Planning Department’s animation of approved downtown projects and projects under construction from your mobile device.